Walt Disney (NYSE: DIS) has conquered the box office, and now it has its sights set on dominating the streaming market. Last fall, Disney dealt Netflix (NASDAQ: NFLX) a blow after announcing that it would be pulling its beloved titles from that top streaming site amid Disney’s plans to launch a competing service in 2019, including a family friendly streaming site, and a streaming site geared to adults. While Disney is already a production powerhouse on its own, it could soon add the talents behind Twenty-First Century Fox (NASDAQ: FOX) if their $52.4 billion deal passes. Within a few short months, Netflix will suddenly have another competitor to fend off, and this one looks serious. Disney’s moviemaking prowess can be seen with the hit “Black Panther” and will only increase if the Twenty-First Century Fox deal goes through. Image source: Disney. Netflix has been the reigning champion in the streaming space but Disney is starting to look like its most worthy competitor. If the Fox deal passes, Disney is going to get an enviable injection into its already impressive pool of media properties, as well as a majority stake in Hulu. Disney would take control of Fox’s movie studios, Fox’s TV studios, FX Network, as well as the National Geographic Channel — and Disney fully intends to use those assets to help it build out its direct-to-consumer businesses, CEO Bob Iger said on the latest earnings call. The new content produced by the combined company will be distributed across multiple channels, with a special focus on its new streaming platforms, he said. The 20th Century Fox studio currently produces a range of popular TV shows including, This Is Us , Modern Family , The X-Files , and The Simpsons. The drama This Is Us has been a hit with audiences with an average of 16.5 million viewers in 2017 making it the sixth most popular TV show of the year, according to Nielsen. Fox also has a wealth of film titles, such as the X-Men franchise, Deadpool , The Fantastic Four , two Star Wars trilogies, and James Cameron’s Avatar and Titanic . In fact, the combined company would boast seven of the top 10 highest-grossing films of all time, according to Axios. In addition to the wealth of individual titles and franchises, Disney would also absorb Fox’s share of Hulu, giving Disney a majority control of the streaming company. Right now, Fox, Disney and Comcast (NASDAQ: CMCSA) each have a 30% stake in Hulu, while Time Warner (NYSE: TWX) has a 10% stake. After the deal, Disney would own 60% of Hulu. This would give Disney an already up-and-running streaming site that just won eight Emmy awards for The Handmaid’s Tale. Disney could use Hulu as a streaming site geared toward adults while it creates a streaming site for children from the ground up. These two sites would be in addition to ESPN Plus, a subscription service for sports fans, that will launch this spring for $4.99 per month. Disney’s team is already ruling the box office without outside help. It was the top-grossing moviemaker in 2017 and is already dominating the 2018 box office. 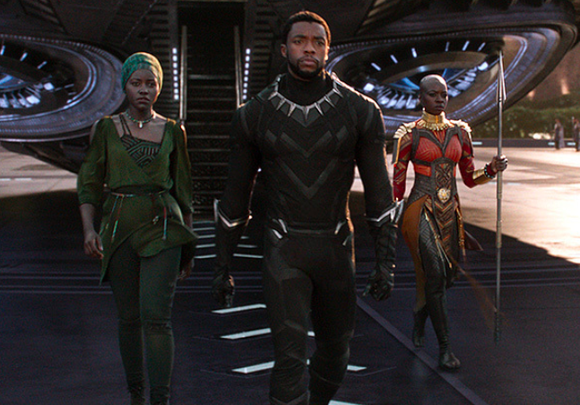 Its superhero movie Black Panther is now the second fastest movie to reach the $400 million mark. And in the next three months, Disney will release several more anticipated films: A Wrinkle in Time, based on the highly acclaimed novel; Avengers: Infinity War , and Solo: A Star Wars Story. That level of box office success without Fox should scare Netflix because nothing is stopping Disney from releasing that same type of audience-pleasing, high-caliber content on its new streaming platforms next year. Netflix has honed a lucrative strategy in which it grows by hiring the best talent — which has included signing show-runners who were previously under the Disney umbrella. By continually producing high-quality shows, Netflix naturally expands its subscriber base and can even raise prices occasionally without too much fuss from users. “Hire great people, give them the resources to make great content, and get out of their way,” is how Netflix chief content officer Ted Sarandos explained the strategy on the last earnings call. Disney has clearly been paying attention, according to comments made by Iger on the last call. “I think the way to look at the revenue opportunities, as particularly as it relates to production, is to consider the fact that what we’re buying here is significant production capabilities and, with that, the talent to produce on our behalf,” Iger told investors. While Disney will miss out on Murphy’s talents if it acquires Fox, it also made a big hire in 2018. At the end of January, Disney hired former Apple and Samsung (NASDAQOTH: SSNLF) exec Kevin Swint to help it launch its new streaming service. He will serve as senior vice president and general manager of the yet-to-be-named service. Swint’s last two years have been as a tech and media consultant, according to his LinkedIn page. But prior to that, he worked for two years as vice president of product, content and services at Samsung. And before that, he spent five years as the director of international movies at Apple’s (NASDAQ: AAPL) iTunes. Disney will have a lot to prove next year when it launches its streaming sites. Last year, Netflix subscribers watched over 50 billion hours of content on the platform, according to the company’s data. But Disney has a significant advantage over any company trying to produce original content from the bottom up: Its already solid base of intellectual property and a team of highly talented people. If there’s one up-and-coming streaming player that Netflix should be paying close attention to, it’s Disney. Natalie Walters has no position in any of the stocks mentioned. The Motley Fool owns shares of and recommends Apple, Netflix, and Walt Disney. The Motley Fool has the following options: long January 2020 $150 calls on Apple and short January 2020 $155 calls on Apple. The Motley Fool recommends Comcast. The Motley Fool has a disclosure policy . Does Walt Disney Have What It Takes to Go Head to Head Against Netflix?